I had the pleasure of helping some friends in need this week. 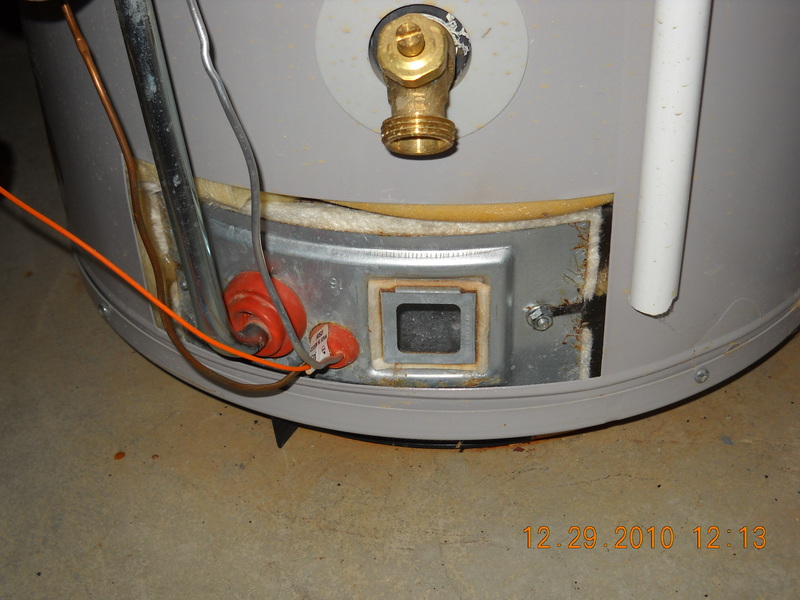 Seems that both their water heaters had gone cold and they couldn’t get the pilot lights to stay on. As much as these two work out, they really do need showers!! Well, I got there and sure enough I could get the pilot lights to light but after they brought the tank up to temp and the main burner went off, the pilot lights went out as well. BOTH of them?!?! Very weird. Most likely one had been out and the other one was forced to work harder and the problem was discovered when the second one finally failed. These are gas water heaters from AO Smith and only about 5 years old. Things do not look promising. When I looked in the chamber at the bottom where the burner is located, both burner assemblies were covered quite liberally with rust flakes. I think I can safely say that you don’t want to see signs of rusting on the inside part of an appliance that holds 40-50 gallons of really hot water with the ability of more water to flow into the appliance if it suddenly loses the 40-50 gallons. Not cool, in layman’s terms. All this aside, it did make me think of a useful post. We’ll start by going through a brief troubleshooting checklist for a gas water heater. Location where you will be working. This is a sealed combustion chamber which is more difficult. Hopefully you will just have to remove flame shields. On to the thermocouple. Grab some fine steel wool or emory paper for this next step. 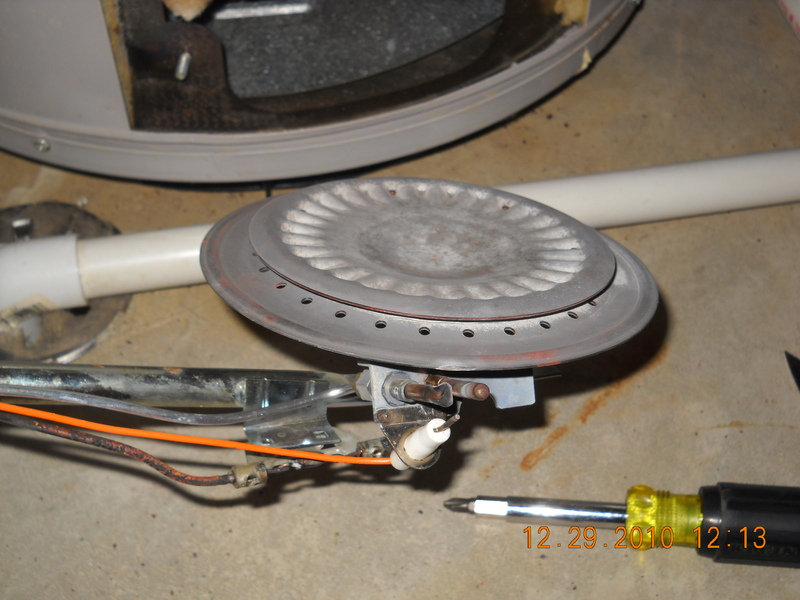 After you have turned your gas off and pulled out the burner plate from the bottom of the water heater we will clean off the thermocouple (see pics). 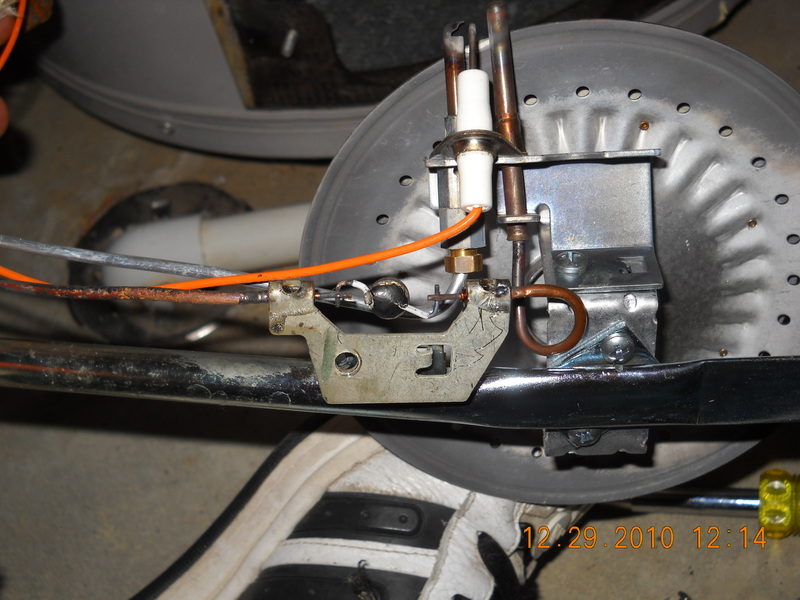 The thermocouple is on the right with the copper wire attached. The white piece is the gas line for the pilot light. I want you to scrub the end of the thermocouple with the steel wool or the fine grit emory cloth. It doesn’t have to be Martha Stewart clean, just wiped down a bit. We are going to reassemble everything to see if this takes care of it, if not the thermocouple will need to be replaced. Go through all the lighting steps again. Goes without saying, but also turn the gas back on. I say this because I forgot to on this last job and thought I made things worse. Woops :). I also like to vacuum out the area under the water heater while everytrhing is out if needed. Lit and stayed lit! Start singing “We Are The Champions” and grab a beer. You are the King/Queen for the day and don’t let anyone forget it for at least one day, seriously. Lit but would not stay lit. Don’t panic and/or tell anyone. King/Queen for the day is still up for grabs. Gas off, take everything back apart. This is where you need to remove the thermocouple and replace with the universal one you bought. Just install in reverse of the removal. Put back together and warm up those pipes (Vocal, that is). This plate lookin' thingy is the burner plate. When your water heater fires up to heat the water in the tank, there will be flames all around the edge of this. You can vacuum this off as well if you would like. This should do it. Milk this victory for everything it is worth. Play tired so your significant other will grab you beers while you rest on the couch, see if you can work pancakes in the morning, etc. On the serious side, you will have saved yourself some good dinero though. If these steps did not work, drop me a comment and I will try to guide you through some other options. You are the best! Thanks for the help and wonderful advice!